Both special FAST FENCE electric nets have black and white mesh with white posts to distinguish them from the regular FAST FENCE standard and fine mesh electric nets that come in orange or green. This special electric netting design is required for areas of very low rainfall like arid western American regions and other areas that are very sandy with regular very dry seasons because the drier earth cannot be depended upon to complete the circuit and shock animals as intended. Dry Country electric nets are Dual Polarity and can be operated with alternating "hot and cold" wires (sometimes referred to as pos neg or positive negative) which makes them the most predator repellent style available. However, they may also be operated as "all hot" just like regular electric nets to avoid all the possible problems with "hot and cold" style fences. Dry Country Dual Polarity Combo Mesh Nets are the most versatile electric net fence made. They are tall, have tighter standard mesh with very tight bottom mesh, and can be operated as "hot and cold" or "all hot" fences. Rolls are 165 feet (50 m) long and 42" tall (105cm) "for control of most animals large and small". Some guy strings and stakes are provided for use at corners. All FAST FENCE electric fences have clips and tie strings for attaching one net to the next and a small repair kit in case any fence netting becomes torn or broken. Heavy duty 5 foot and 4 foot Post Kits and Gate Nets for each style of net are available handy accessories. With Dual Polarity nets, animals are shocked when they touch two adjacent wire strands with opposite polarity (one positive and one negative) at the same time. The earth or ground is not used or needed to complete the electrical circuit. Alternate strands are separately connected together at the ends of the net so that the netting fences can be operated either in Dual Polarity mode or regular "all hot" mode. Dry Country Nets also have Combo Mesh with mostly standard 4" x 6" mesh but with two extra non-conductive strands at the bottom to make a finer and tighter 2" x 6" mesh for a more effective fence with smaller animals and predators. 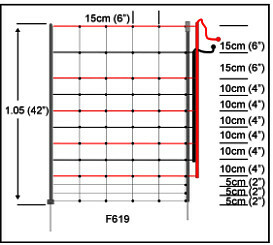 This smaller mesh size area is a barrier that tends to push animals up into the electrified portion of the fence. However, these extra strands do not leak any electric shock from the fence or permit any short circuits. 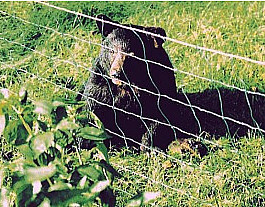 Wildlife control - All FAST FENCE Nets have been used successfully to control various types of predators and other wildlife. Protecting bee hives from black bears at New England berry farms, keeping squirrels, skunks, and raccoons from landscape ponds and pools, and personal protection while camping from bears, mountain lions, and other wild animals are some of the more unusual applications. They have even been used for raising wolves, too. Click here for more wildlife photos. Universal 42" Nets are black and white, 42" (105 cm) tall, 165' (50 m) long with the same Combo Mesh at the bottom as Dry Country Nets (see above) and come with Ground Pins for better small animal control. They are a black and white alternative to the standard mesh orange or green nets. 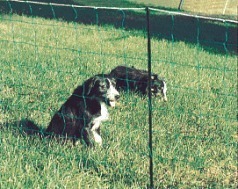 Since FAST FENCE Nets are so easy to move, cleaning the dog pen is less necessary and mowing the grass is much easier. Taller nets are better for larger animal dog pens or dogs prone to jumping and shorter electric nets work fine for other dogs. The fine mesh nets are best for very small animal control. Portable and temporary dog pens have never been easier. The electric fence energizer is sold separately. 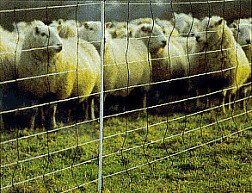 FAST FENCE electric fencing netting replaces more permanent woven wire field fence (aka hog wire, American wire, Page wire, mesh wire, and net wire) at much lower total costs. 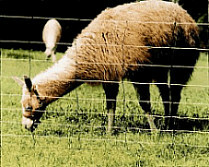 Other uses include temporary and portable fencing for rotational grazing (aka controlled grazing & intensive grazing), fencing for the control of alpacas, llamas, horses, ponies, cows, cattle, calves, predator control, sheep, lambs, goats, chickens, ducks, turkeys, other poultry, rabbits, hogs, pigs, gardens and controlled intensive rotational grazing, swine, cats, dog pens, and protection from all kinds of wildlife and animal pests, especially for gardens.